Dr Shah with Dr Alfons Geukens, an eminent educationist and the head of the Center of Classical Homeopathy where Dr Shah taught in 1989. Dr Rajesh Shah's first clinic was inaugurated by Dr B.N.Chakravarty, a leading homoeopath and Hon. Homeopath to the President of India, May 1985. Dr Chakravarty was kind enough to come all the way from Kolkatta to inaugurate the clinic as he had lots of affection for Dr Rajesh. Interestingly, he was also a personal homeopath to superstar Amitabh Bachachan. Dr Rupal and Dr Rajesh enjoying the moment when the later entered the Limca Book of world records for treating patients from highest number of countries, year 2000. 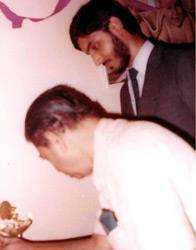 Dr Shah with George Vithoulcas, in Greece, where Dr Shah was invited to teach to the international group of students, in 1999. Dr Shah was invited to teach at the International Academy of Classical Homeopathy, headed by great Greek guru George Vithoulkas, in 1999. 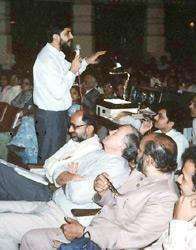 Dr Shah making a point at a seminar in India, 1994, attended by some of the leading teachers in homeopathy.